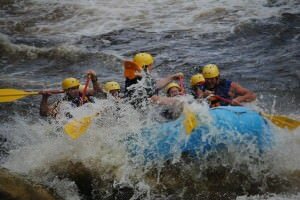 NYC to the Closest Whitewater – Raft the Lehigh River! Twisting turns, rollicking rapids, and Sourced Adventures. There’s no better recipe for an awesome day on the Lehigh River! We’re teaming up with our friends at Sourced Adventures to bring you the best Whitewater Rafting Day Trip from NYC! If you’re looking for an excuse to escape the city on a hot summer day, we’ve got you covered. Cruise down 9 miles of class III rapids all the while taking in some of the best scenery the Poconos has to offer. The river runs through miles of pristine gorge, allowing you to feel secluded and remote, despite being just 2 hours away from NYC. Jump on the fun bus out to Whitewater Challengers, where you’ll take a short ride to the Lehigh River for a day of rafting down Class II to III rapids on the river’s best dam-release days. You’ll raft for two to three hours, then break for lunch before taking down the rest of the river. Whitewater Rafting is one of our favorite summer pastimes, so don’t miss out… When the city gets hot this is a great way to cool off! DON’T MISS THE RIVER!!! DON’T MISS THE BUS!!! If you’ve never joined us, what are you waiting for? No skills necessary – its a raft going down a river…. This river is great for introductory rafters and a great way for experienced rafters to satisfy their fix. 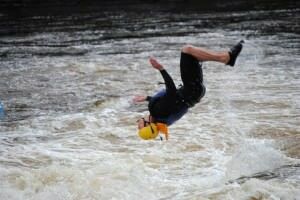 This entry was posted in Events, Featured, Lehigh River, News, NYC, OvRcrew, Summertime, The Beach, Trips, Whitewater Rafting. Bookmark the permalink.